Hi everyone! I'm currently typing this post up very, very very excited as I go on holiday tomorrow, yay! I'm going to the beautiful Puerto Banus with my boyfriend and his family and I cannot wait to relax in the sun for a whole week sipping on cocktails - ahhh, bliss! I've been really stressed out lately so a week away will do me the world of good. We leave at 4am tomorrow morning and I still have so much to do. Why am I such a last minute Larry? If you've been reading my blog for a while, you'll know that I'm quite the spendaholic. I feel like half of my life is spent shopping and half of my blog posts are hauls. Oops, what can I say, I have no will power. Now I don't know about you but when it comes to holiday shopping, the tendency to whip out my bank card like it has an unlimited amount of cash is stronger than ever. Over the past few weeks its safe to say I've used and abused that little piece of plastic in my purse and I have to be honest, I don't feel guilty about it. If we can't treat ourselves to nice new clothes, shoes and accessories before going on holiday, when can we? The first pair are from these beautiful ankle strap heels from Zara and I absolutely love them. As soon as I spotted them on the Zara website, they had to be mine. I love that the heel isn't too big so they'll be comfortable to wear on evenings out whilst still looking stylish. The thin ankle strap adds such an elegant touch to these shoes and the gold heel obviously adds some wow factor. I have to be honest and say I thought the heel was cream when I saw them online so although I was surprised when I opened the box to see a gold heel staring back at me, it was a pleasant surprise. I can't wait to wear them! The next four pairs I bought are from good old Matalan, one of my favourite high street shops. I've said it before and I'll say it again, Matalan is so under-rated for fashion. I'm sure people presume its full of frumpy clothing for the middle-aged housewife but seriously, you need to go and have a browse. They have some amazing on trend bits and pieces up for grabs and I especially love their shoes (if you hadn't guessed) and accessories. I love going to Matalan for a good mooch around just as much as I love going to Primark or H&M and I always come away with some bargains. They've really upped their game in the shoe department with their recent Spring/Summer collection and I loved so many of their latest offerings, I bought four pairs! Whoops. However, due to Matalan's amazing prices, I didn't actually spend too much money. First up are these cool black gladiator sandals that are a little bit 'out there' for me but I love them regardless. These are pretty edgy and cool and I can see them looking great with flowing girly dresses to add a bit of edge to the outfit. They look fabulous on and I think they could be worn dressed up or down which makes them even more appealing! Next are these gorgeous chunky tan wedges which in my opinion are the perfect Summer shoe. As soon as I spotted them on the Matalan website, they had to be mine, I didn't even give it a second thought. I have a thing about wearing tan wedges in the Summer and I seem to buy a new pair every year. I think they're the perfect shoes to pair with a Summer outfit and although they look scary high, they're actually pretty comfy. These ones I picked up have a this cool wedge heel running right along the base of the shoe and a nice padded sole meaning they're comfortable and easy to walk in. They will definitely be one of my most worn shoe of the holiday - I can see myself throwing them on most evenings! 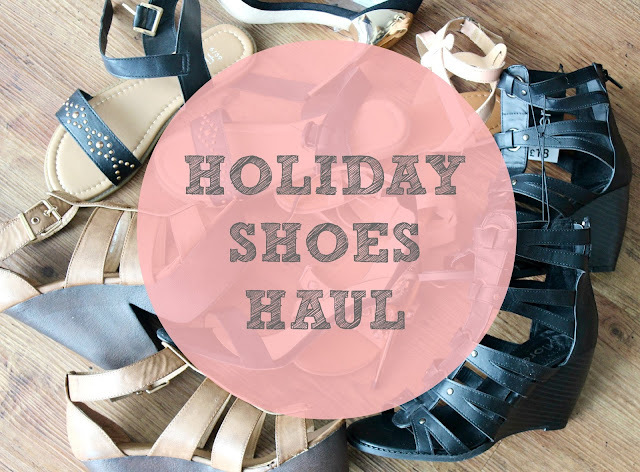 Next up we have two pairs of sandals and lets face it, holiday footwear wouldn't be complete without a couple of pairs of sandals for wearing by the pool or down to the beach. I decided to go for a black and tan pair so I've got something to match every outfit (miss organised) and I love both of them. 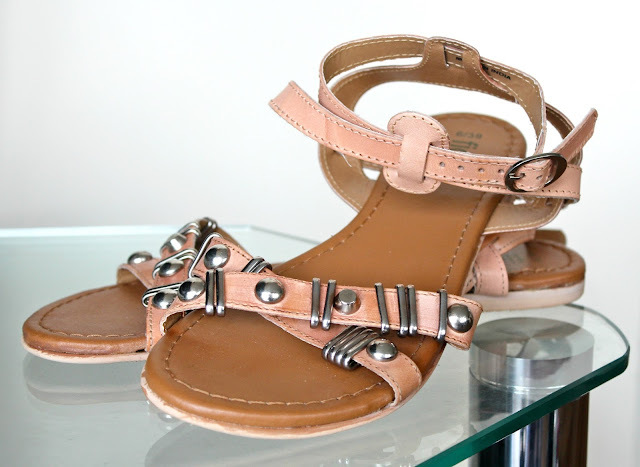 I was a big fan of studs throughout winter so its nice to incorporate them into my summer wardrobe with these black studded sandals and the tan leather pair with interesting silver metal work stood out to me as soon as I saw them. Tan and Silver isn't normally a colour combo you'd see paired together so I like the fact they're that little bit different but will still go with almost all of my holiday clothing. All this talk of Matalan has reminded me to remind you (wow, what a mouthful) that I'm currently taking part in one of their 'Style Project' competitions. Myself and three other bloggers have gone head to head to create the perfect festival outfit and I had so much fun coming up with my outfit. Head over to their blog here and if you like the outfit I chose, I'd love you to take a second to vote for me. If I win I'll win a £50 voucher which would be amazing for me as you all know how much I love Matalan! I hope you enjoyed this post and maybe spotted a pair of shoes you like the look of. Most of them are still available online (I've linked them all within the post apart from the tan wedges which I couldn't find on the Matalan website) so go and snap yourself a pair up while you've still got the chance. I won't be blogging next week while I'm away but I do have five amazing guest bloggers lined up for you all so make sure you check back for those. Speak to you all soon! Have an amazing holiday, I'm super jealous! I love the black studded sandals. omg I want the chunky platform ones!! As if they are from Matalan, they look like Topshop ones! Love this! The Zara shoes are stunning! I have eyeing up quite a few of their shoes! I'm loving the ankle strap thing they have going on with a lot of their shoes. Those brown shoes from Matalan are amazing. I always seem to get good jewellery from Matalan but I've never checked out their shoes, will certainly do so next time! My favourite is the tan wedges! I love Matalan too :) In my latest beach essentials post, my gorgeous bikini and beach throwover is from there and you really wouldn't think it! It has some gorgeous stuff. I always buy a pair of flat sandals for summer and basically live in them for a month or two, untill they are completely wrecked haha! Can't survive summer without sandals! I can't believe those shoes are from Matalan, I need them! I saw those Zara ones tonight and loved then, good choice! I've seen those same zara shoes in every colour under the sun, okay maybe not, and I want them all. Are they comfortable to walk in? I have the tan wedges and was surprised at their comfort considering they are from Matalan! Great post - have a fab time! wow!!! awesome collection. I like these. thanks. Love the Zara shoes. So elegant! Snap! Those Zara heels just arrived at my house too! Those Zara ones! They make my feet smile! Amazing Matalan finds. I love it in there. I found this amazing polka dot playsuit last year, whenever I wear it no one believes where I bought it! I've been eyeing up those zara sandals for ages! Really love them! These shoes are all so beautiful! Love every shoe here!! Hope you have a fabulous time on your holiday! Loved this post, I never knew Matalan did such great shoes! Really like the chunky tan heels, just checked online and they do a white version too :D will be taking a trip to Matalan very soon :) thanks for the heads up!